Any project calls for some prep work to turn out well. American Clay and other plasters are no different. After cleaning the surface, anything that doesn't need plaster gets taped off and covered with a drop cloth or plastic to keep it clean. Next, primer with washed sand is rolled or brushed onto the surfaces getting clay. This creates a surface that American Clay can form a strong bond with. The wall is now ready for plaster! American Clay is a two-coat product. The first coat is nearly always Loma, their original and most popular finish. On top of the Loma coat, we apply your choice of finish coat: ranging from the ultra-smooth Porcelina to the ocean-infused Marittimo. For fireplaces, bathrooms, or areas that see more traffic, American Clay's Forté plasters provide extra durability. 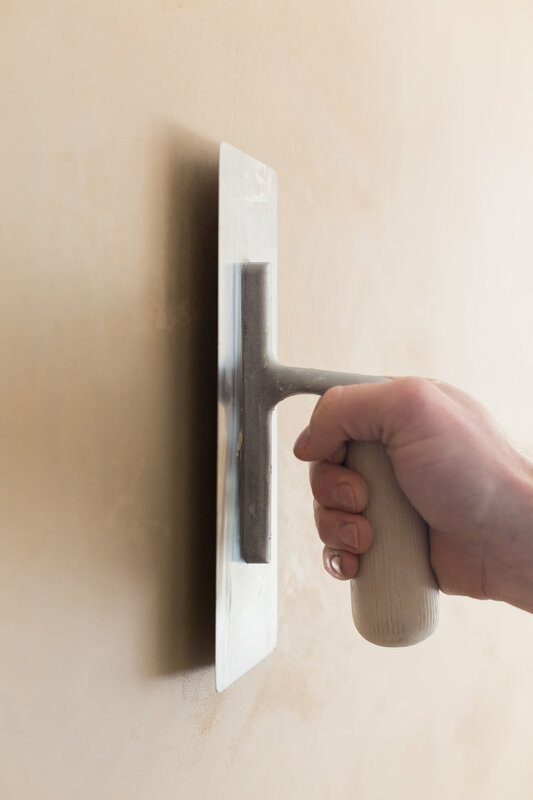 The two coats of clay on the wall will be slightly dusty, coming off on your hands or clothes when you touch the wall. To eliminate this, the final step of compression is essential. This is similar to burnishing the clay by applying a little bit of water and going over the clay again with a trowel or sponge. This lays the clay particles flat and smooth along the wall so they can't catch on hands or clothing. This also creates the movement and stone-like appearance of the clay. The final outcome: a smooth, eye-catching, all-natural wall or ceiling in any room of your house. For your walls to impress, you must compress.